Critics rave "pure gold" "5 stars" "really entertaining" "highly recommend"
Strangers in Paradise #90 - The final issue of this award-winning series arrives in May. Get ready for the finale: order Terry's DVD today! From Terry: It's funny, how this video and the Treasury seem to compliment each other. They are both retrospectives. They're not redundant because one medium covers things the other can't. It's wonderful. I love the extra DVD goodies, the director comments, the shots of Houston locations, etc. With the release of these two items, I guess I really have marked the end of an era. Which is good, a nice feeling of accomplishment and time to move on. Note: TX residents add 8 1/4% sales tax. Checks must clear your financial institution prior to processing your order. International S&H rates will vary. We'll be happy to provide you an estimated shipping cost. *United Kingdom & Canada, S&H is $4.95 for the first DVD, and $2.95 for each additional DVD. 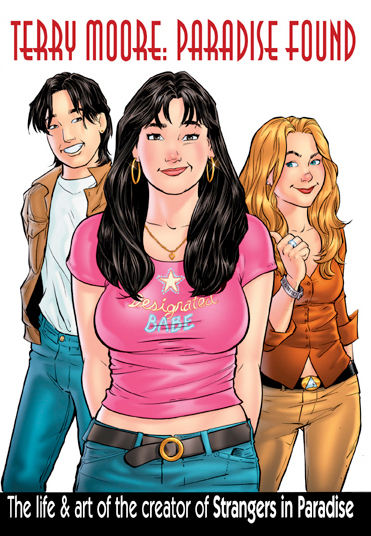 (c) 2004 Strangers In Paradise is a trademark of Terry Moore. "I grew up wanting to be either a rock-playing god or a cartoonist." "The actual act of writing and drawing SiP is kind of a performance art than an intellectual exercise." Terry won the 2004 Reuben for Best Comic Book from the National Cartoonists Society! "In agreeing to be interviewed, Moore placed his trust in Jurls and the Hero Video Productions team, and he has been pleased with the results. "It’s been a really wonderful experience to work with them. I knew I was in good hands." "Terry Moore: Paradise Found is the inaugural DVD in Hero Video Productions’ line of original content, with an extended video interview with Moore forming the core of the disc." "...exceptionally illuminating for any reader of Moore’s work." "Moore manages to be both deeply thoughtful and wickedly funny." "The DVD itself is very well crafted and doesn't use annoying DVD "features" like long and noisy animated menus or overlong transition sequences." "...the combination of an interesting and engaging subject and the high quality of the final product make this disc indispensable for any fans of Moore’s work." "The interview is very in depth, the interviewer really gets into Terry's head and Terry tells all. I was completely glued through the whole interview." "Hero Productions is producing DVDs that are provocative, thought stimulating and just plain exciting to watch. I can't wait to see what Hero Productions has up their sleeve! Hero Productions are definitely movers and shakers!" "...long and fascinating interview with Terry..."
"The DVD is very professionally done (by Hero Video Productions)"
"If you have ever been to an artist’s alley at a comic convention, then you probably know the feeling of the energy that radiates from the gathering of such creative people. “Terry Moore: Paradise Found” radiates the same energy, and you cannot help but be inspired by this artist and his work. If you are already one of Terry’s fans, then this DVD is pure gold; if you are not yet acquainted with his work, then this video will leave you wanting to see more." "Paradise Found is well organized and very informative to both fans and those who wish to succeed in the comic industry. It is also inspirational, reinforcing that a career as an independent comic book creator is still possible." "...this DVD holds quite a bit of excellent information and material." "...the DVD gets a high rating, and I am sure we will watch it again and again." "The interview, while the core of the DVD at over an hour in length, is just part of the goodies on this beast." "...the best feature on the disc, I found, was a collection of Moore's music, including songs included in the book and excerpts from his youth as a struggling musician. 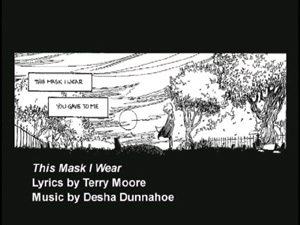 The most powerful piece, however is a song sung by Desha Dunnahoe." "...PARADISE FOUND presents something other than extra features tacked onto releases of big league superhero movies. It is an intimate conversation with an artist who has captivated a section of the industry for years, and seems honestly happy to get the chance to put his work out there." "Whether you're a fan of STRANGERS IN PARADISE, or even just interested in the creative process and how life lessons can be used to fuel ideas, you can't go wrong with PARADISE FOUND." "Recommended. The movie Terry Moore: Paradise Found package raises the level by giving viewers a bunch of creative extras that explore different aspects of the artist's work. In a lot of respects, the disc may be more for fans than those who have never read the Strangers in Paradise comic book series before; it's a noble independent effort to expose one man's creative process." It's funny, how this video and the Treasury seem to compliment each other. They are both retrospectives. They're not redundant because one medium covers things the other can't. With the release of these two items, I guess I really have marked the end of an era. Which is good, a nice feeling of accomplishment and time to move on. It's wonderful. I love the extra DVD goodies, the director comments, the shots of Houston locations, etc. I think the music section turned out great and I know people will play Desha's song over and over again. Nice job of putting pictures to that, it looks like the animatic for a movie or music video. "My wife watched the DVD with me. Once it was over, she asked "How many trades do we have in the library?" I had to admit there were none (I have most of the first four years of comics tucked in the crawlspace). I now know what to get her for Christmas. So you got a new fan and dragged an old one back." Send mail to webmaster@herovideoproductions.com with questions or comments about this web site.